If you’re a voice over actor, I’ve got news for you. You’re also a customer service worker. Now, maybe you’ve never thought of yourself in this light before, but take a minute to consider. Do you work with people? 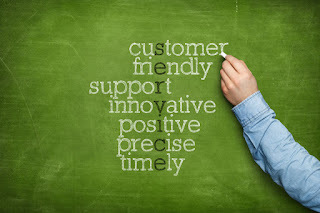 Is it your job to provide them with a quality service with efficiency and politeness? Why, yes it is! Now, here’s how you can be an even better customer service to keep your clients coming back for more. 1. Be helpful. Everyone loves a helpful person, and your clients are no exception. If you can assist them with more than just a recording, they’ll remember this kindness. Perhaps they’ve given you a script that could use a little fine-tuning or has some grammatical errors. This is an opportunity for you to mention this and offer to help. 2. Offer a free sample. Freebies are just a part of life for many in this industry, and especially those who are trying to boost their client list and are working with new clients. Once you’ve made the contact with a person, offer to record a sample of their project for free. It will give them a better idea of what your sound is, and will help both of you decide if you’re the right fit for the project. 3. Be available. I can’t stress this one enough. When they call, call them back. When they email, reply to their message. And do it promptly! 4. Make things easy for them. If you can make it an uncomplicated process to work with you, your clients will love you for it. Make payments easy and streamlined, make it easy for them to contact you, and most importantly, make the process of working with you easy and drama-free. 5. Exceed their expectations. This one doesn’t need too much explanation. Do what you can to go above and beyond what they expect. Get your project done before the deadline, cut an unnecessary fee, and deliver the highest quality product you can. Basically, give it 110%. 6. If you feel are absolutely not right for a project, refer them to someone whom you think will be. Even if it doesn't pan out they'll be thankful to you for your honesty and help.